Big, bowl-shaped bunkers are a piece of cake—shots that find them invariably roll down into the flat, leaving you with a perfect lie. It’s the shallow bunkers that are the most challenging. The ball can end up anywhere—near the lip being a favorite destination when things aren’t really going your way. Not only does ending up near the edge of the bunker affect your stance (how ’bout my position here? ), you can almost guarantee a plugged lie, because the golfers before you raked the hazard from the center out. Lip lies are soft lies. As you can guess, your standard bunker swing won’t cut it. Odds are you’ll have one foot out of the bunker. Fine. Set 80 percent of your weight on it. That’s your anchor. 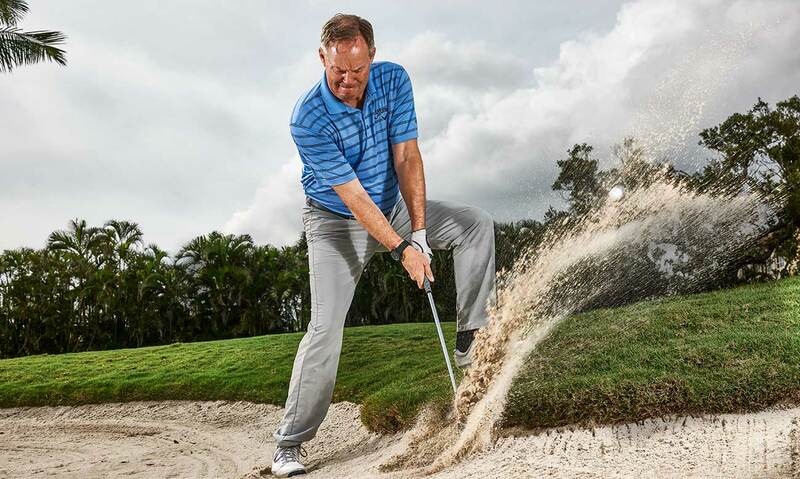 Firm up your hold and take a mighty swing, burying the clubhead in the sand just behind the ball. You got a bad break. Make the bunker pay for it. Pound it! The more you hold back, the more likely the ball will remain in the bunker. 1. Keep your head steady: And make sure your eyes are on your entry point from start to finish. Sliding backward or forward increases the odds of a flub or a skull. Think of your lower body as a foundation, not a moving part. 2. Squeeze the grip: This is a power shot. You can tell by the expression on my face. So take a power grip. If your normal grip pressure is an 8 on a 1-to-10 scale, make this one a 12. You’re chopping wood here, not finessing a wedge. 3. Put pressure on your front foot: Any time you have one foot out of the bunker, make that foot your anchor. Lean into it at address, and keep your weight over it throughout your motion. Your goal: Bury the clubhead in the sand—and leave it there.